TFMT Welcomes Your Comments; But First Some Backstory. When Toni Ingram began her blog, the group who later published the Truth For Morgan blog, was sympathetic and supportive. However, it wasn’t long before each and every one of us noticed glaring inconsistencies and contradictions in the stalking story. Wanting to help Toni but knowing we needed a clear understanding of the facts, we respectfully submitted our questions to the blog. Toni responded to dozens upon dozens of cloyingly sympathetic comments from her regular fandom, but ignored our questions. In fact, they did not even get past Toni’s screening process. Why would she ignore questions from people who only wanted to help? Unfettered, we posted our questions to Morgan’s Stalking Facebook, only to check back and find them deleted. Suffice it to say, this censoring of the truth along with other incidents too numerous to mention, led us to order all reports related to the death of Morgan Ingram, reach out to investigators, and come to our own conclusions. The point here is this: Toni Ingram’s story is inconsistent because it is full of lies. 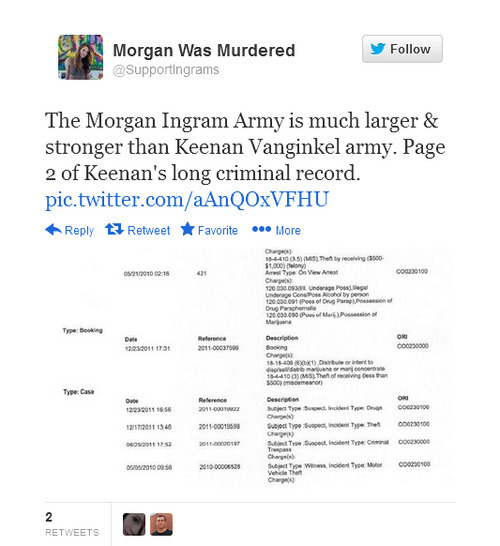 Morgan was not stalked and she was not murdered. She took her own life in the early hours of December 2, 2011. Morgan’s Stalking is a work of fiction concocted by a mentally ill woman unable to cope with her guilt, anger and grief. If you disagree, TFM Tumblr welcomes your comments. A special invitation is extended to Sarah Afshar and her merry band of sycophantic followers. Your comments will not be edited or deleted. The truth doesn’t have to hide. We were blessed to become parents to Keenan in the early 1990’s, he came into this world at 4:53 p.m. weighing 8 lbs. 1 oz. He loved to cuddle and was literally snoring within the first half hour of his life. When we took him home, his father did not believe in putting a baby into the bed for fear of rolling over onto him … so I would wait for his father to go to sleep and then sneak him into bed and cuddle him like a teddy bear. He had a love/hate relationship with his binky when he was about 3 years old. He knew he shouldn’t have it, so we sat down and talked about it. He gave me his binky and told me he didn’t need it anymore, so I took it but put kept it close to me just in case. Later that night, I heard him moaning and tossing so I asked him if he wanted it back and he said “No mommy, I ok,” and that was that for Mr. Binky. Keenan was always so patient and loving, the light of everyone’s life, especially my dad, aka Papa. He would always tell his Papa, “La loo!” which was “love you”. They have a great relationship to this day. Keenan loves fishing, hockey and the outdoors in general. He first played hockey in Marble. They have a small rink outside and the whole town would come together on the weekends, and everyone — no matter the age — would get the chance to play. Keenan was really good at it; so good the townspeople started calling him Little Roy, as in Patrick Roy. He later played for the Grizzly’s in Glenwood, but soon lost the heart for it when his idol, Patrick Roy, retired from the Colorado Avalanche. He is still happy and loving, no matter what the circumstances. He went to a Christian school until the 8th grade and always made sure his older sister was okay. He watched over her and loves her very much, as well as his baby sister and baby brother. He always shares everything he has. As a child he was at a birthday party at school one time and a piñata was broken. Keenan, like all the other children, ran into the middle of the fray and collected quite the stash of candy, but when a little girl looked at him and batted her eyelashes, Keenan quickly gave all of the candy to her with a smile, because that is who he is. He has the same generosity and big heart to this day. He’s a protector, a brother, a son, and a person anyone would be proud to call a friend. Our son was raised with the bible and taught to know our Lord, which is a lot more than most parents can say today. He has patience and knows that God has a plan for him, through all of these trials and tribulations. Rather than get caught up in the lies and hatred directed towards him, he has chosen to wait for guidance, wait for the Lord’s plans to be revealed. We wait with him and stand by his side during this hardship and are grateful to the people who can see the truth through all the smoke and misdirection. We take our cues from the Lord, not self proclaimed psychic and charlatans. We raised a wonderful son, and are proud of him each and every day.